I don’t know about you but as soon as I became a Christian I wanted to do something FOR God. I was a pregnant teen who found forgiveness and freedom and I wanted to make my life count for Him. Over the years I found many ways to serve Him and to be truthful it was a lot of work. I taught Sunday School, led Bible studies, and volunteered in numerous ministries in church. I found myself wanting to shout, “No, enough is enough!” I was burnt out to say the least. 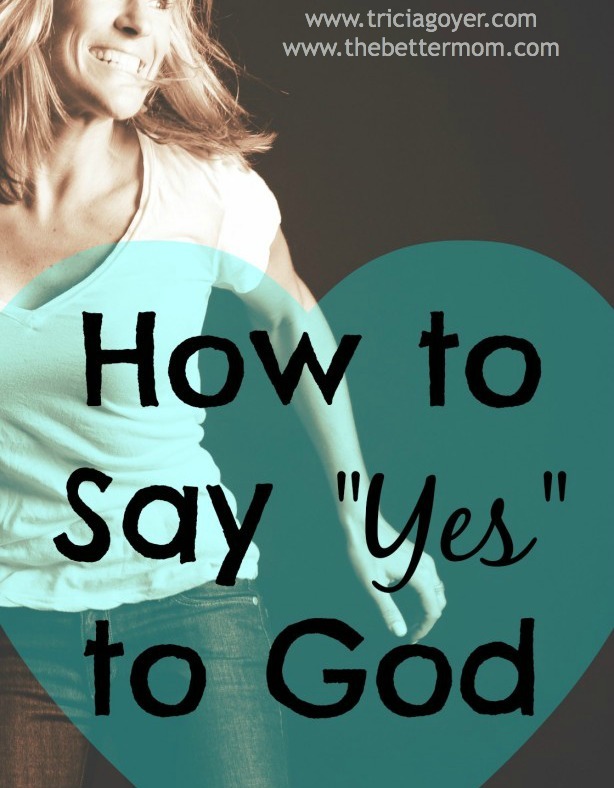 By burning myself out, I thought I was saying, “Yes” to God. Over time I learned that there is a difference between saying yes to my ideas vs. saying yes to God. So how do you know what God wants? And how do you say yes? God’s calling to you will be different than His calling to anyone else. What is He asking of you? Ask God to make you aware. For example, in 1999 I read an article about orphans in China and my heart was stirred. Over the years I was drawn to adopt. It took many years before my husband was open to the idea, yet God made me aware of the plight of orphans long before He called me to do anything about it. It took 10 years from the time God made me aware of the situation until we brought a baby girl home, but it all started with God making me aware of the need. God, thank you for giving me a life in which I get to say “yes” to you everyday. Give me awareness of the things that matter to you. Help me to make choices that reflect my desire to say yes to you over saying yes to my own ideas. Congratulations to Kerry M., winner of Darlene Schact’s new book, Messy Beautiful Love!